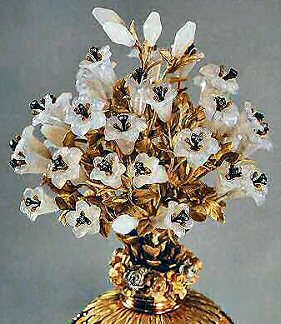 The 1899 Madonna Lily Clock Egg is also known as Bouquet of Lilies Clock Egg and is made of varicolored gold, platinum, rose-cut diamonds, white onyx, translucent yellow enamel and opaque white enamel. 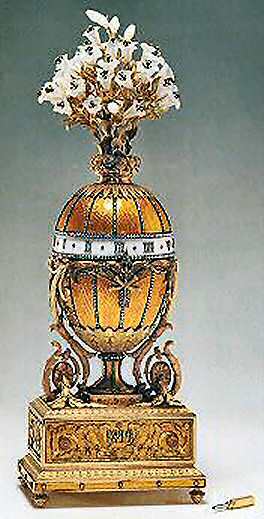 The rectangular pedestal and egg-shaped clock are decorated with translucent enamel on a guilloche background. The clock is crowned with a delicate bouquet of lilies, carved from onyx. The pistils of the flowers are set with three small diamonds, and the leaves and stems are of tinted gold. The body of the clock is divided into twelve parts which are outlined in diamond-studded stripes. The diamond clock hand is in the shape of an arrow which protrudes from an immobile base. A diamond and enameled belt with twelve diamond-set Roman numerals revolves around the perimeter of the Egg, indicating the time. 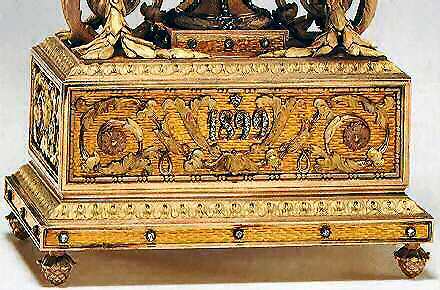 The base is decorated with rosettes and the date of its manufacture, 1899, is set in diamonds. A gold key was used to wind the mechanism. The Egg uses the language of flowers, the roses (symbols of love) with lilies (symbols of purity and innocence), and the flowers like torches suggest the virtuous flames of family love. The now missing pendant was made with ruby and rose-cut diamonds. 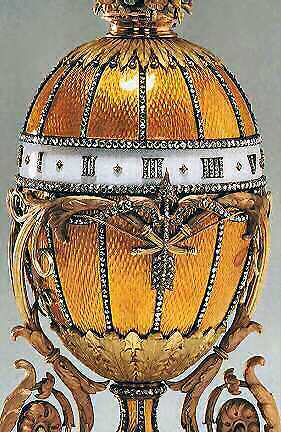 An early Fabergé photograph is extant showing the ruby and rose diamond pendant that accompanied this Egg. The Madonna Lily Clock Egg was never sold. In 1927 it was transferred to the Moscow Armoury Museum. and is one of the ten Imperial Eggs kept there.